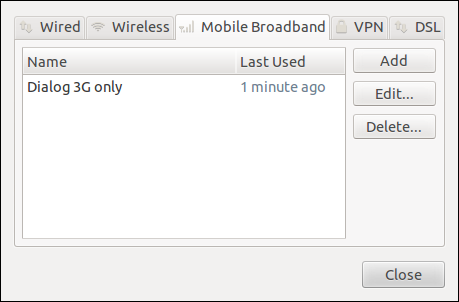 Here I'm providing an optimal solution to have a faster 3G broadband connection in Ubuntu/Linux. As many of you have experienced, the connection speed is really bad especially at peak times in most of the 3G networks. Here I'm providing a set of configurations I have tried that seems to work great. This way, you will be able surf only on 3G (UMTS/HSPA) without falling back to slower protocols like EDGE. Further, this will reduce the domain look-up time, and speed up authentication. The settings were configured using network-manager that comes with Ubuntu by default. The network-manager is available at the systray (top-right corner of top panel). The instructions are for Dialog Service Provider in Sri Lanka, but apply for other providers with minor changes. I have adopted some of these using resources 1, and 2. Now, click on the network-manager icon in systray, and go to "Edit Connections...". This will open up a dialog box that looks like the following. I have selected the "Mobile Broadband" tab here. If you want to optimize an existing connection, click on Edit to open the edit window. Otherwise, create a new connection which will open the edit window as well. There are three tabs which you can change. 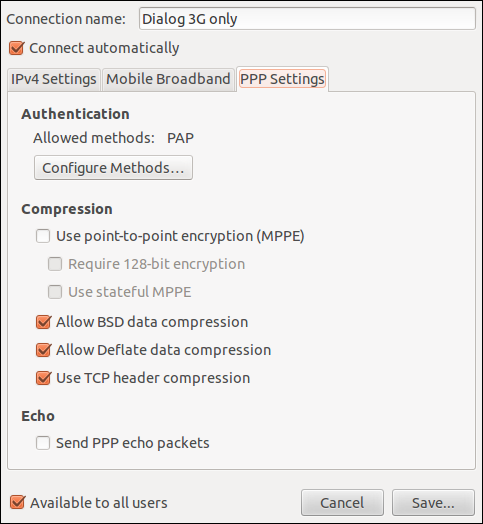 PPP Settings tab - Click on "Configure Methods...". Uncheck all the checkboxes except PAP. Click on OK.
2. 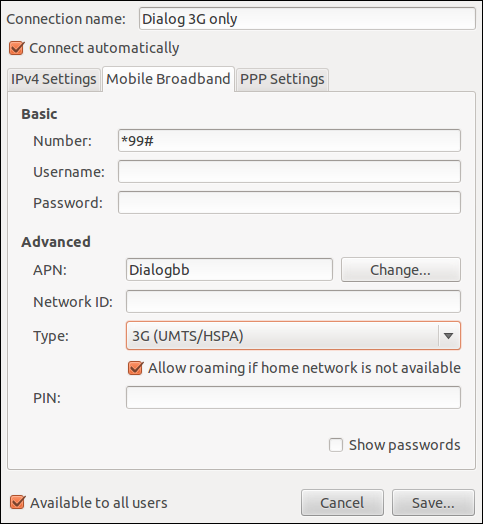 Mobile Broadband tab - For Type: field, select 3G (UMTS/HSPA). The Number field should be "*99#", and the APN should be Dialogbb which are the defaults. 3. 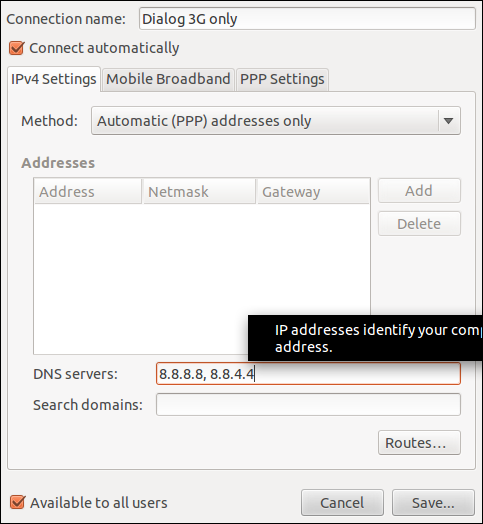 IPv4 Settings tab - For DNS Servers, enter 8.8.8.8, 8.8.4.4 . These are for the DNS service provided by Google. There are alternatives like OpenDNS as well. Resources for these available in web, and these two are quite reliable.